This is the site of the Kangaroo Inn. Located Aproximately 15 Klms away from Clovelly. Arcoss the road from the Kargaroo Inn ruins is the “Kangaroo Inn Area School” (KIAS) it is a Child Parent Centre to Year 12 school with an enrolment of approximately 185 students. 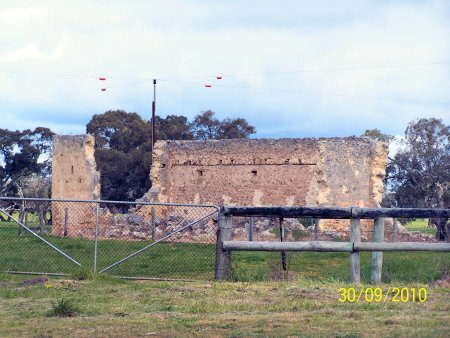 The Kangaroo Inn ruins are located at the intersection of the Penola-Beachport/Robe-Penola Road approximately 28 km from Beachport, 55km from Robe and 60km from Penola. I know you were lagged for stealing ten-pennorth of hay; don't you mind you told us in the Kangaroo Inn, once when you were drunk, that you was lagged for stealing the hay. Kangaroo Inn was built in the 1840’s. It became a licensed premises from 1861 till 1878. 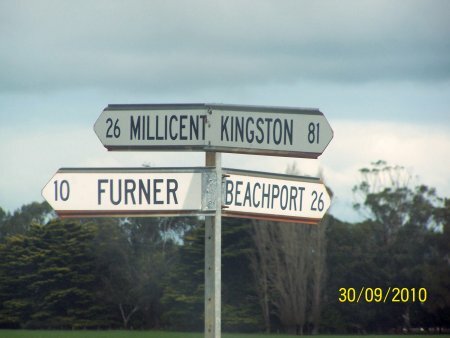 Located on what was the Old Overland Road to Melbourne. In its heyday during the construction of the early drains, (1861-1878) the Inn serviced traffic from every direction, and was an important stopping point along the Mail Route and bullocky Route. From 1840 till 1861 and again from 1878 till 1888, the Inn although unlicensed aparently conducted a popular liquor trade. For building materials, stone was quarried with pick and shovel from the stony ridges on the site of the buildings. Once hewn into bricks with stone chippers, the stone was mortared together with a mixture of lime and sand. The ceiling consisted of lathe and plaster; the roof slats and iron. The bar door (made of thick wood) was suspended on hinges at the top, so it could be quickly lowered to protect the men inside the event of trouble outside. These old buildings (built entirely by local labour and none of our present-day machinery) were very strong and have withstood the test of time. The history of the Inn is as varied as it is long. 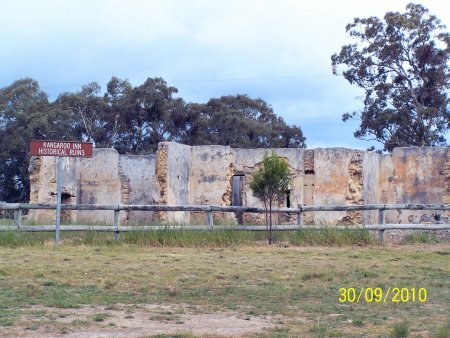 Originally it was a junction station built prior to the Victorian Gold Rush, and used as a resting place for mail coach drivers and the general public travelling between Adelaide, Penola and Mt Gambier. From 1854 William Rounsevell began mail-coach runs from Adelaide through to Mt Gambier. In 1867 Cobb and Co took over the mail-coach run. 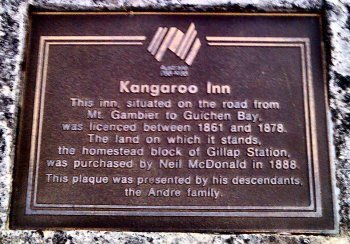 Settlers from Guichen Bay and coaches would stop at Kangaroo Inn to refresh and rest both horses and people. Then it was a 30 mile journey (about 1 day) before the next inn was reached. If going to Penola, this was Paynes Inn, Mount Gambier, the Mt Burr Hotel, or Adelaide, the Telegraph Inn. Few Chinese en route for the Victorian Goldfields ever stopped at these Inns or stations, as they were illegal immigrants, and frightened of being apprehended by government officials. Rather, they would build wells well off the worn route. Some of these are still landmarks in the district today. Although unlicensed, Kangaroo Inn had a popular liquor trade - bringing the district its share of troubles. 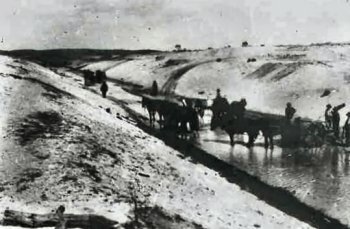 Once, whilst the Reedy Creek Drain was being excavated by hand, a murder was committed. After a drunken brawl at the Inn between a Furner resident and a navvy working on the drain, the navvy was found dead between “Kangaroo” and “Paynes” Inn. 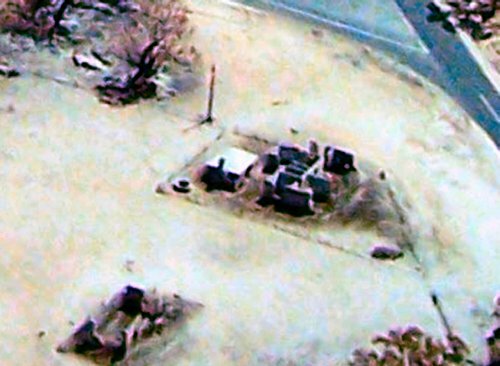 The case remained unsolved, and even today it is a matter of speculation as to who was the killer - The Furner resident or the local aborigines. In 1878, the proprietors of the Inn were Mr and Mrs Grant, who later settled in Furner. During this time railways were taking over the business of mail coaches, so the Inn gradually lost trade. It was finally closed in 1886, when the Kintore Hotel was opened at Furner by Mr A H Bellinger. Later, the Inn was converted to an overseers cottage for Gillap Station, then owned by Mr N M Donald (Senior). 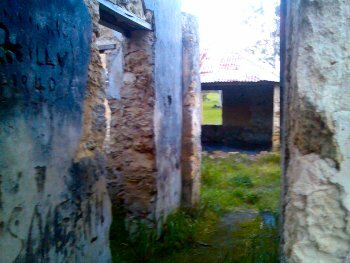 The remains of the shearing shed and old sheep dip can be found nearby. 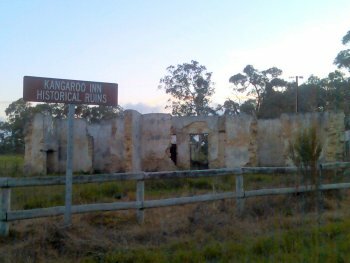 In the years after this, Kangaroo Inn was mostly deserted - occasionally being used as a camp by woodcutters. Now it hasn’t been used for a long time and is partially in ruins. 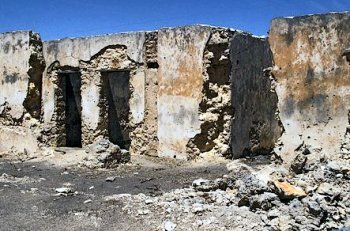 Thanks to South Australia Jubilee 150 Youth Grant, the ruins of Kangaroo Inn have been restored to their present state. Landing in Port Adelaide, accompanied by her husband, Mr. John McDonald, They settled in the Kingston SE district shortly after, and Mrs. Witt’s first husband was in the employ of Mr. James Cooke, Whose name is closely identified with the early history of that place. Later Mr. McDonald was employed by Mr. J. Brown, of Baker’s Range. 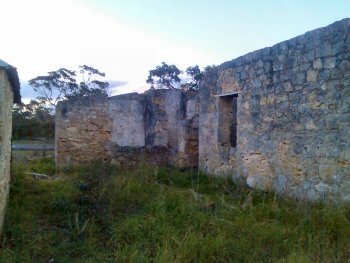 Subsequently Mr. and Mrs. McDonald took charge of the Kangaroo Inn, which was then the house of call on the road between Penola and Robe. Travellers between Adelaide and Mount Gambier in those days had to pass the Kangaroo Inn, and many of the early colonists bave partaken of Mrs. Witt’s hospitality. 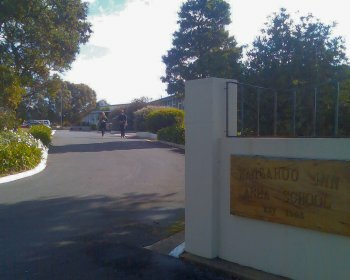 After conducting the Kangaroo Inn for six or seven years Mrs. Witt and her busband went on the land at Kalangadoo for a time. About 1868 they came to Naracoorte and purchased the freehold of the Merino Inn, now the Narracoorte Hotel. Mrs Witt’s first husband died three weeks after they took over the business. She carried on the hotel herself for about eight years, and effected several improvements to it during her occupancy. She erected an assembly hall beside the hotel, and this was opened by Sir James Fergusson, then Governor of the State. 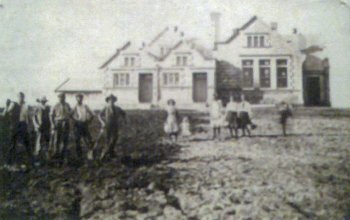 Mrs. Witt sold tbe business of the Narracoorte Hotel to Mr. Savage and the freehold of the property to Mr. Beaglebole, of Adelaide, and bought the freehold of the Royal Mail Hotel, at Kingston SE in 1877. She carried on the business successfully for a couple of years and then sold out. She then went to Tasmania, later returning to the scenes of her former days and settling at Kingston SE. She paid a visit to her native land, Wales, and on her return resided at Mount Gambier for a few years, after which she returned to Kingston SE. Mrs. Witt was married to her second husband in 1881, and he survived her.